The Fairplex hosted its second annual Dia de los Muertos celebration last Saturday. This Hispanic holiday, also referred to as the Day of the Dead, is celebrated on Nov. 1 to honor those who have died. “En Memoria,” brought together visual artists and low rider culture to celebrate with art, music and food. “It’s a reconnection with our antepasados (ancestors),” said Sonia Canchola, Rancho Cucamonga resident. 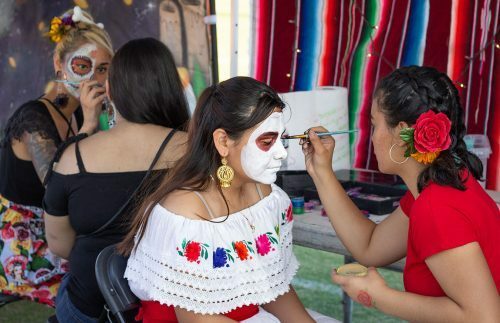 Some of these traditions of Dia de los Muertos include offering remembrances, masses, rosaries and altars with pictures and food, Canchola said. People ate Mexican food, ranging from elotes in a cup to carne asada burritos and danced to traditional music. They also walked around the remodeled lowriders that were on display. Some owners had altars, known as ofrendas, in and around their cars to honor their loved ones who have died. Car owners were proud to share what they had created, but two individuals, Eddie Rodriguez, owner of a 1962 Chevy Impala and Carranza, had a more emotional connection showcasing their cars. Rodriguez said his license plate reads, “PSLM 21” as a reminder that God will give one the strength needed to fight all battles. Carranza had a similar experience as Rodriguez. This event brought together people from many different cities, lifestyles and backgrounds to celebrate their ancestors. The event had an “En Memoria” skulls installation sculpted by LORE Art Director Marcus Pollitz. The installation featured eight large-scale skulls painted in vibrant colors. The skulls, a staple symbol of the holiday, represent death and rebirth. Carranza said she is looking forward to attending the celebration again next year. “We represent our loved ones that have passed on, so we are here to celebrate their lives,” said Carranza.